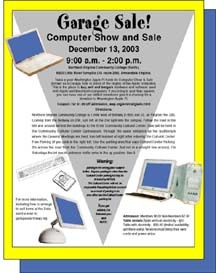 Frequently called "The Computer Garage Sale"
The winter edition of the twice-yearly (but sometimes semi-annual) Washington Apple Pi Computer Sale and Show was held December 13, 2003. You can download a copy of the commemorative poster, suitable for framing, in Adobe Acrobat or JPEG format. 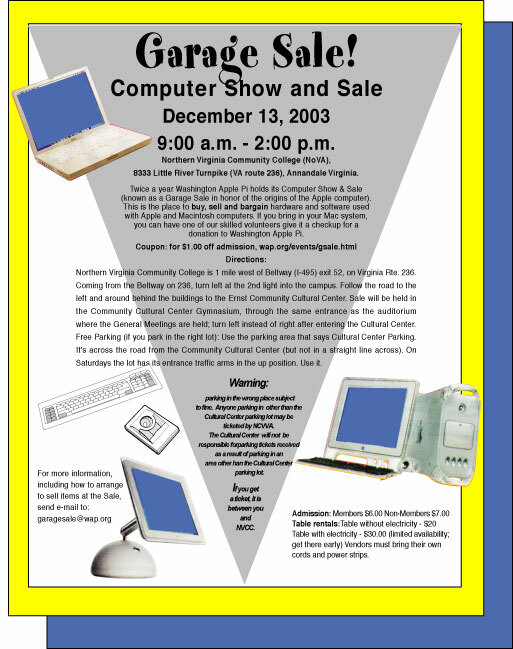 While it won't do you a whit of good, you can also download the commemorative coupon, in Adobe Acrobat or JPEG format. Photos: we have photos! In fact, we have an entire Richard Sanderson photo gallery, which shows what you can do with a Nikon D-100 digital camera.